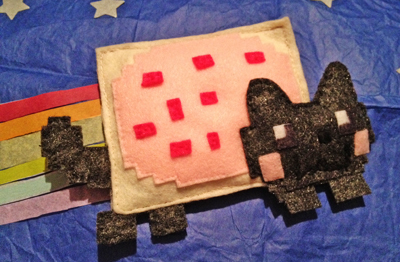 Handcrafted Delights » Blog Archive » It’s a Nyan Cat Christmas! It’s a Nyan Cat Christmas! Sophie is so in love with this video! Nyan Cat makes her laugh every time. So, I’ve been working on a special Christmas present for her and finally finished him and his packaging tonight! Can’t wait for her to open it! 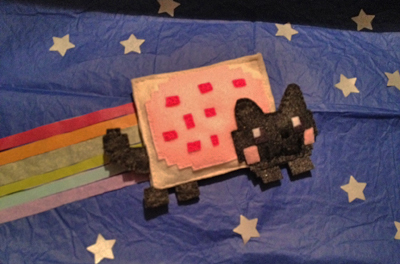 Nyan Cat is made out of felt and stuffed with a little bit of batting. The eyes were colored in with a black Sharpie. The box is lined with tissue paper and paper punched silver stars. If only I could get the music to kick on when the box is opened! This entry was posted on Thursday, December 22nd, 2011 at 12:08 am	and is filed under gifting. You can follow any responses to this entry through the RSS 2.0 feed. You can leave a response, or trackback from your own site.